The Type 5 Na-To is a Rank III Japanese tank destroyer with a battle rating of 3.3 (AB/RB/SB). It was introduced along with the initial Japanese Ground Forces tree in Update 1.65 "Way of the Samurai". 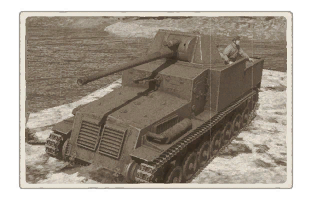 The Type 5 Na-To is a rather traditional tank destroyer of a simple vehicle chassis with a gun pasted on top. It is highly vulnerable to many battlefield weapons due to its weak overall armour, but if it can get the jump on an enemy, it can wreck havoc. Thus, one should not play the Na-To as a front-line weapon but as a sniper far back behind the front lines. This will ensure the Na-To will not become a priority target and also to maximize the gun's long-range capacity to take out targets. Watch frequently traveled roads and choke points for enemy, then blast them away before retreating to reload in case they are still active after the first shot. Belly armour is 8.5 mm thick. Ammo racks of the Na-To. 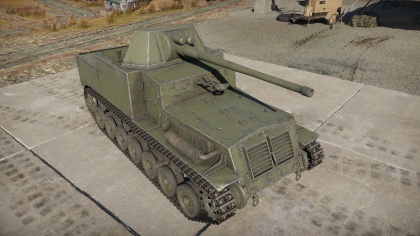 With the Type 5 tank gun, the Na-To presents a lethal gun that can penetrate all the the tanks at its 3.3 BR range. Assuming it is not upped by another vehicle in the line-up with a higher BR, the worst heavy tank the Na-To could face are the Soviet KV-1S and British Churchill Mk III, both with front armour easily penetratable by the Na-To's 75 mm gun at standard ranges without taking angling into consideration. However, the thin armour of the Na-To does mean that any tank it faces could defeat the Na-To, so always get the first shot off at the enemy. Playing the Na-To as a sniper support from a long distance from the front-line will provide the Na-To increased survivability and also potentially more targets to aim at than with its limited traverse arc up close. If long range is not possible, keep the Na-To stationed at a cover's corner watching an enemy's frequented area. As soon as one shows up, blast away before retreating to cover. High penetrating 75 mm cannon can pretty much destroy any vehicle in its BR range. Gun can traverse a rather wide angle to the side. Six-man crew can provide some degree of crew loss before a crew knockout occurs. Rear ammo racks can lessen the chance of front penetrations detonating it. Excellent reloading speed for a gun of such high penetration and damage. Paper-thin armour of overall 12 mm. Front engine an easy target that will immobilize vehicle if hit. Open-top crew compartment exposes crew to artillery and airstrikes. All the crew are rather lined up, leading to shells able to knock out 2-4 crew members at a time. Two prominent ammo racks on the rear sides of the cabin, easy targets to ammo-rack kill. The Type 5 Na-to was a tank destroyer based on the Type 4 Chi-So armored medium tracked carrier developed in 1945. It used a 75mm tank gun, known as the Type I 75mm. This was a lighter version of the Type II 75mm tank gun used by the Chi-To and Chi-Ri. The Na-To had two prototypes, known simply as the Na-To I and Na-To II. The Na-To I used a variant of the Type I 75mm gun known as the "Type 1 75mm Model I". The Na-To II used the Type I 75mm Model II. Following trials, the Na-To II was selected over the Na-To I to be mass-produced. An order was placed for 200 vehicles to be made, but by the end of the war only 70 of them were started, with none reaching completion. This page was last edited on 10 February 2019, at 04:05.